NASSAU, Bahamas — On the first day new immigration rules took effect [in November] in the Bahamas, officers in green fatigues swept through poor sections of the capital filling two yellow school buses with dozens of people who couldn’t document their right to be in the island chain. The government, amid fierce criticism of the raid, later insisted the timing of the operation was coincidence. Still, the message of the surprise morning raid, in which the officers were accompanied by local media, couldn’t be clearer: [immigration laws will be enforced]. Mitchell said haphazard enforcement of existing laws has put too many people in legal limbo and has made the Bahamas a magnet for migrants, arriving often in dangerously overloaded smuggling vessels. ….. The new rules may be particularly tricky for people who were born in the Bahamas to people who migrated illegally. While the constitution allowed them to apply for Bahamian citizenship, many did not. Now, before they can seek legal status — a process that has no guaranteed outcome — they first will need to obtain passports from “home countries” they may never have seen. A similar situation has been playing out in the Dominican Republic, which borders Haiti and is attempting to regulate a much larger population of people lacking legal status. ….. NOTE: The Bahamas became an independent Commonwealth realm in 1973, retaining Queen Elizabeth II as its monarch. In terms of gross domestic product per capita, the Bahamas is one of the richest countries in the Americas (following the United States and Canada). Its economy is based on tourism and finance. Thousands of people braved sub-zero temperatures on the streets of the state capital, Erfurt, on Thursday night (Dec. 4) to protest against the expected result of the vote. German Chancellor Angela Merkel predicted the decision would be “bad news” for Thuringia, while the German President, Joachim Gauck, broke with the traditional neutrality of his role to speak out against it. But the state parliament voted to approve Mr. Ramelow’s three-way coalition after the Social Democrat party, Mrs. Merkel’s partner in the federal government, rejected an alliance with her Christian Democrat party in the state. Although Mr. Ramelow grew up in West Germany, many of the Left Party’s leadership were senior figures in the East German communist party and some have been accused of links with the Stasi secret police. Thuringia was part of East Germany until reunification, and many have expressed dismay at the former communists’ return to power. “Old SED [Socialist Unity Party] comrades and Stasi informers run the state now,” said Rainer Wagner, chairman of the Union of Victims’ Associations of Communist Tyranny. 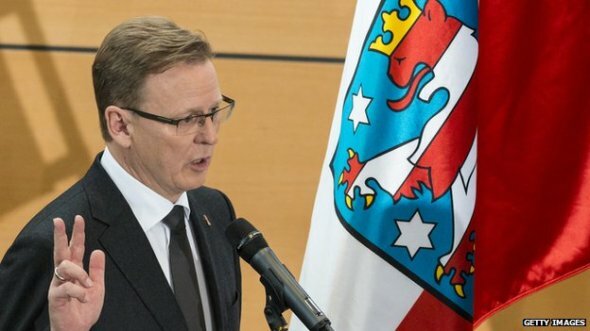 Bodo Ramelow was sworn in as Thuringia state prime minister on Friday. PARIS — Thousands of Holocaust survivors and family members in the United States and elsewhere will be entitled to compensation from a $60 million French-U.S. fund announced Friday – reparations to those deported by France’s state rail company SNCF during the Nazi occupation of France. 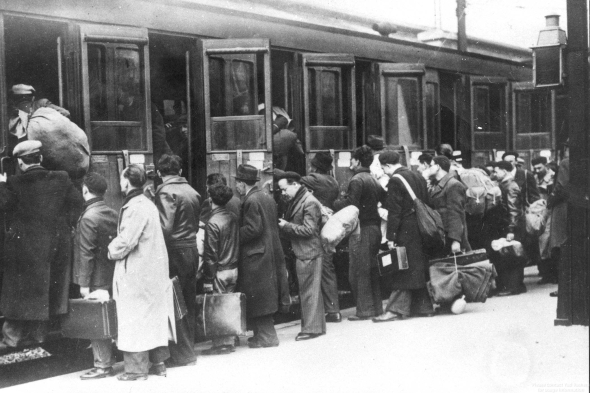 Paris, France, Jews getting on a deportation train bound for a detention camp, May 14, 1941. The compensation fund will be financed by the French government and managed by the United States. The accord will be signed Monday in Washington, but it still must get approval from the French Parliament, which could take months. France’s government has already paid more than $6 billion in reparations, but only to French citizens and certain deportees. The new accord is to help compensate Americans, Israelis and some others who were not eligible for other French reparations programs. Patrizianna Sparacino-Thiellay, a French ambassador for human rights who worked closely with Eizenstat on the accord, said “hundreds” of people in the U.S. are eligible under the new fund as direct survivors or spouses, and several thousand could be eligible as heirs. The money should break down to about $100,000 each for survivors and tens of thousands of dollars for spouses, said Eizenstat. Only in 1995 did France acknowledge a direct role in the Holocaust, when then-President Jacques Chirac said the state bore responsibility. Subsequent compensation programs paid out compensation worth hundreds of millions of dollars. The German government has paid around 70 billion euros ($85 billion) in compensation for Nazi crimes, mainly to Jewish survivors. France already has international accords with four countries – Poland, Belgium, Britain and the Czech Republic – over compensation for deportation victims. Friday’s deal aims to fill the remaining gaps in justice for others also affected. Patrizianna Sparacino-Thiellay said the French government wanted to finish the deal by year-end in part for symbolic reasons: France is hosting several events marking 70 years since the Allies liberated France from the Nazis in 1944. ….. The deal comes as France, home to western Europe’s largest Jewish community, is facing new concerns about anti-Semitism. France’s leading Jewish organization, CRIF, estimates that the number of anti-Semitic incidents has grown 91 percent this year compared to a year ago. The Stasi were the official secret police of East Germany. As the most comprehensive internal security organization of the Cold War, it was the most effective, and repressive, intelligence and secret police agencies in the world. Founded by the Soviets in 1947 and reorganized in 1950, the Stasi’s motto was Schild und Schwert der Partei (“Shield and Sword of the Party”). The Stasi was much larger in East Germany than the Gestapo had been in the Nazi state. Like its Soviet model, the Stasi constituted a secret police force, a secret intelligence agency, and an official investigative organ. The Stasi systematically infiltrated every part of society, and used hundreds of thousands of secret informers to ensure that ideas [against the government] were immediately identified and rooted out. No one trusted anyone outside their family. 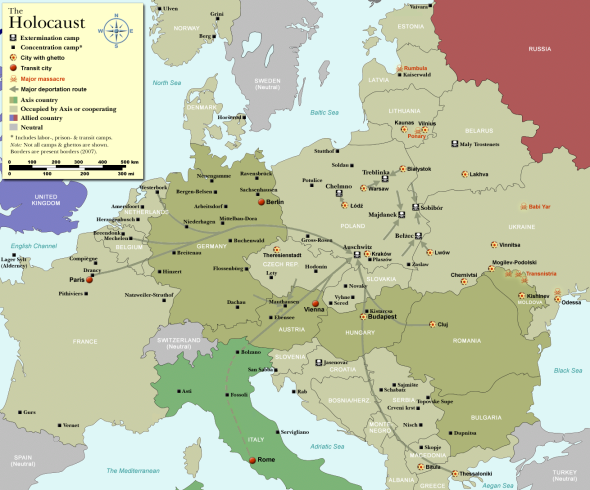 The Stasi controlled a widespread network of informants, and out of a population of 16 million it is estimated that 400,000 people were active informants. The Stasi maintained files on 6 million of its own citizens, more than 38% of the entire population, and all telephone calls and mail from the West were monitored. Stasi operatives routinely collected scent samples (Geruchsproben “smell samples”) from people by wiping cloth over objects they had touched or by breaking into people’s homes and stealing their dirty underwear, the samples then being stored in airtight containers. The scents were then passed to police equipped with sniffer dogs who could pick the individuals out amid a crowd. People were imprisoned and tortured simply for telling political jokes.